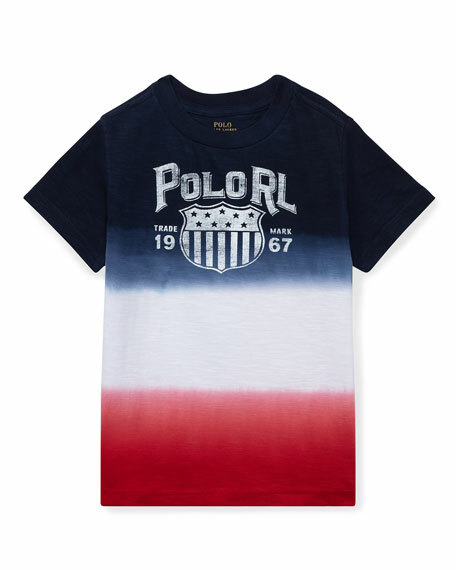 Ralph Lauren Childrenswear ombré striped T-shirt. Polo RL logo at front. Florence Eiseman T-shirt with lobster appliqu?? at right shoulder. Crew neckline. Short sleeves. Pullover style. Ribbed trim. Pima cotton. Made in Peru. Kenzo T-shirt featuring oversized, multicolored logo lettering across front and back hem. Crew neckline; snaps at left shoulder. Short sleeves.